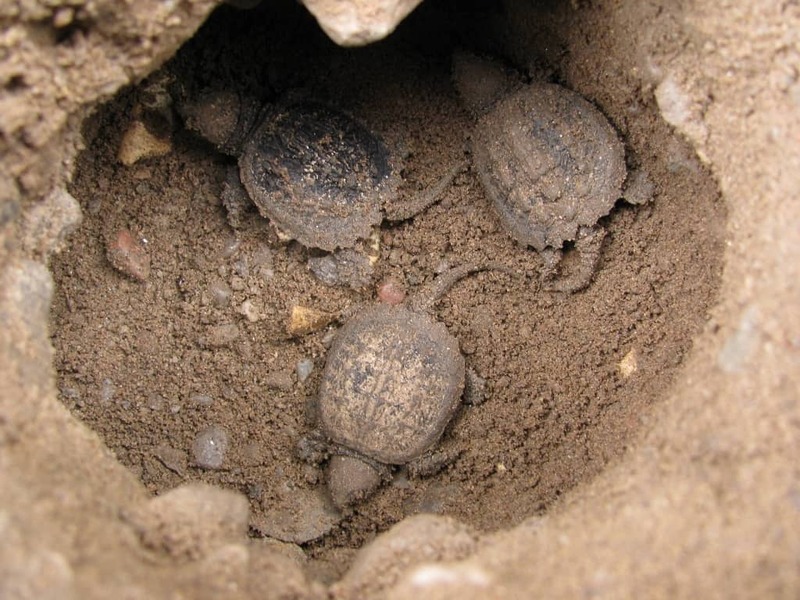 Snapping Turtles hatching … but confused? Happy to report that between October 5th to 7th we were able to deliver twenty-three Snapping Turtle hatchlings to shallow muddy areas on our stretch of the Indian River. But the event was puzzling in a couple of ways. 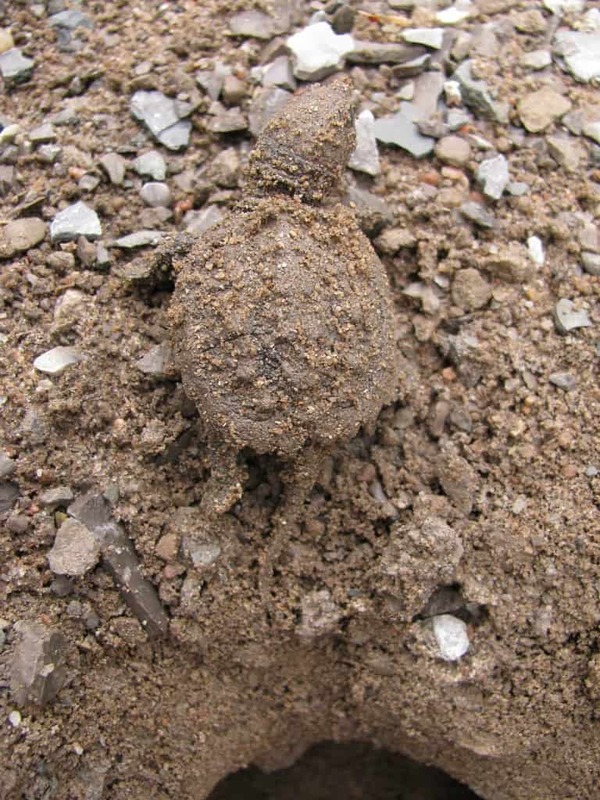 Back on July 1st we witnessed an adult Snapping Turtle in our gravelled turning circle spend at least an hour, probably more, excavating a hole and laying her eggs. Although we couldn’t see the eggs from our vantage point in the house, we observed her finally swinging side to side, bracing herself using front feet and tail as she covered in the hole with her hind feet. 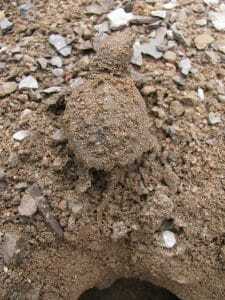 We protected the site with chicken wire weighed down with stone on all sides, and so far this covered site shows no indication of disturbance or any natural breakout. 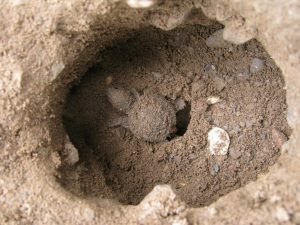 However, on October 5th after spotting a number of hatchlings wandering around on the gravelled turning circle and driveway, we identified the source and it was one totally unknown to us: – a small hole about four inches wide, which was about 18 feet away from the protected area. It was from here that we could see hatchlings emerging. All the hatchlings that we found had absorbed their sacs. Only one looked very poorly but after a while perked up while it was sitting in a shallow tray with some water. Apart from the twenty-three, there were another three we found that had been crushed by traffic on the road. We actually saw only six emerge from the nest over the three days, some with a bit of help, while most of the others were found wandering around and may have first emerged on October 4th when we were away for the day. Almost all of the latter were heading west up the gravelled surface towards the road, a distance about 320 feet, whereas the river is about 270 feet away on a downward slope in the opposite direction. If we hadn’t regularly monitored the drive with some help from interested neighbours, most of the hatchlings would probably have either been run over on the road or perished for lack of appropriate habitat. This is not the first time that we have had hatchlings choosing to go westwards, away from the river, rather than heading east towards water. This is in stark contrast to our first encounter with hatchlings back in 2007, when we encountered seven young snappers on our property; all were heading east towards the river following a stone path alongside our house. Something appears wrong, but we don’t know what.